Finally ! Blocked and gifted. 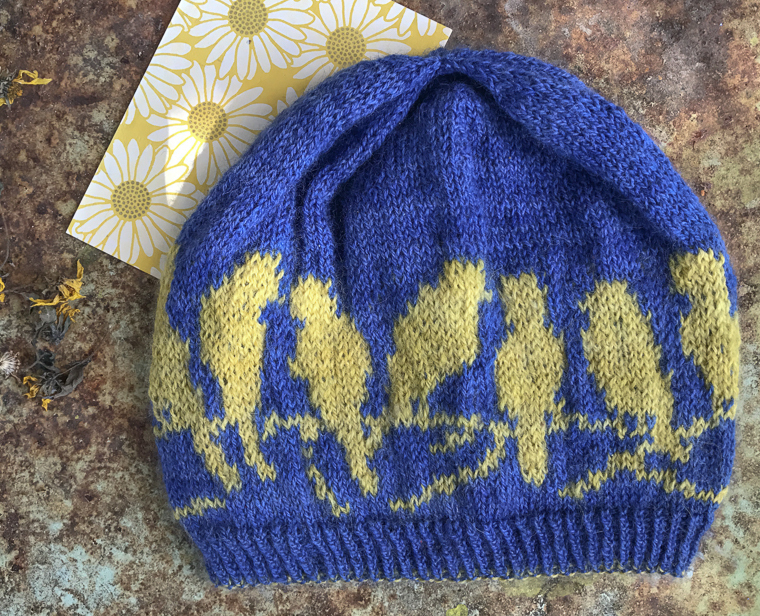 The Passerine Hat. In the loveliest Starcroft Fog yarn from Maine island sheep. It's a sweet hat, just go in prepared! 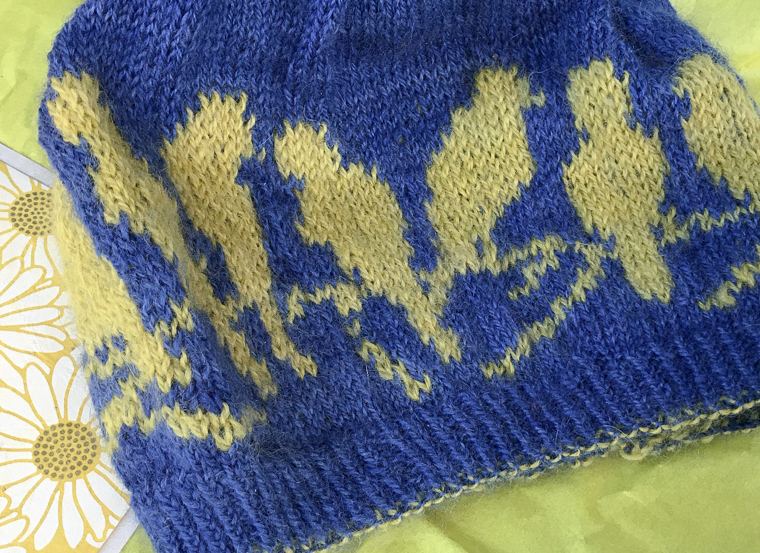 A few notes: the yarn I chose has a slight halo, which softens the outline of the birds a bit but also covers the contrast if a catch shows--so overall a win. I added a few rounds in the decreases, to make it slightly slouchy and less beanie. I decided the Keynote was best. 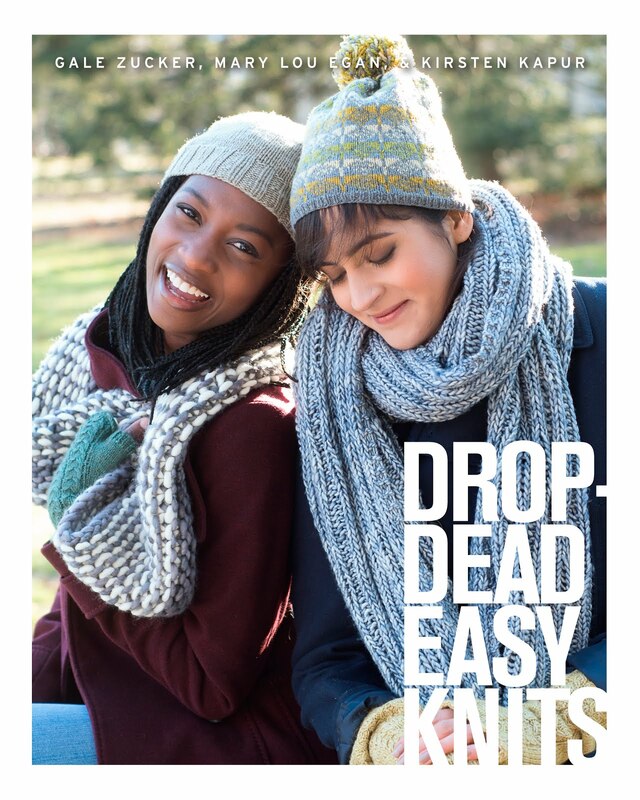 Back with another limerick lede spotlight on a pattern from Drop Dead Easy Knits by Kirsten Kapur, Mary Lou Egan, and me. This time, we are talking the Keynote Pullover by Mary Lou Egan. Here's our model Josephine wearing it, in the book. 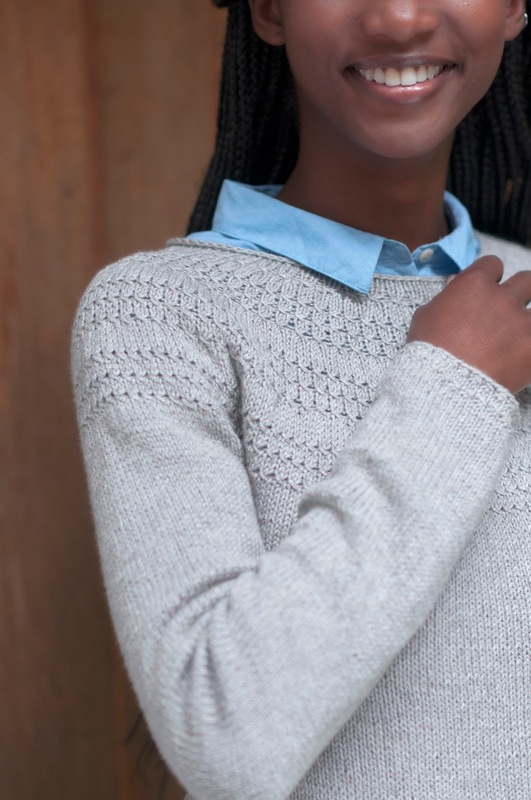 This sweater is knit from the bottom up, with the decorative sections of Moire stitch taking place at the cuffs and at the yoke. (Moire is a series of eyelets, very easy, with a fawncy sounding name...no cables or tricksy moves) . Mary Lou, who attends a lot of conferences for her day job, designed Keynote as the kind of sweater you might knit on quietly while listening to presenters, making the body and sleeves, doing all the stockinette. Not too attention getting in the audience, no need to check charts or juggle multiple strands of yarn or anything like that. Then, join it and do the yoke in your hotel room later, when you want to pay a bit more attention to the row counts. I loved it from the earliest swatches, and offered to test knit it in the same yarn Berroco gave us for the book: Fiora, in a silvery grey. Wow, do I love it. 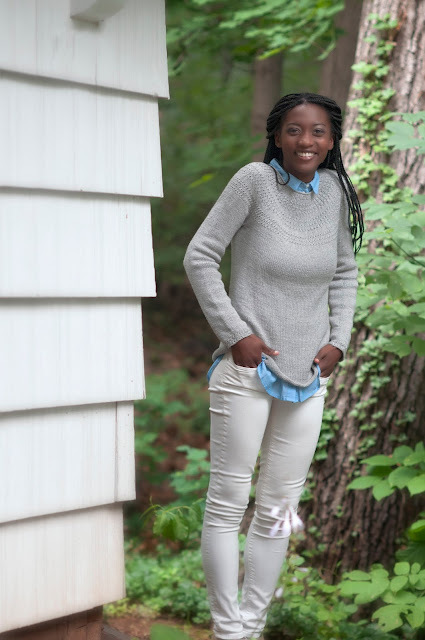 It's a cotton/viscose/alpaca blend that knits up well, has a nice drape and best of all--you can throw it in the washer and dryer and it comes out looking seriously good as new. 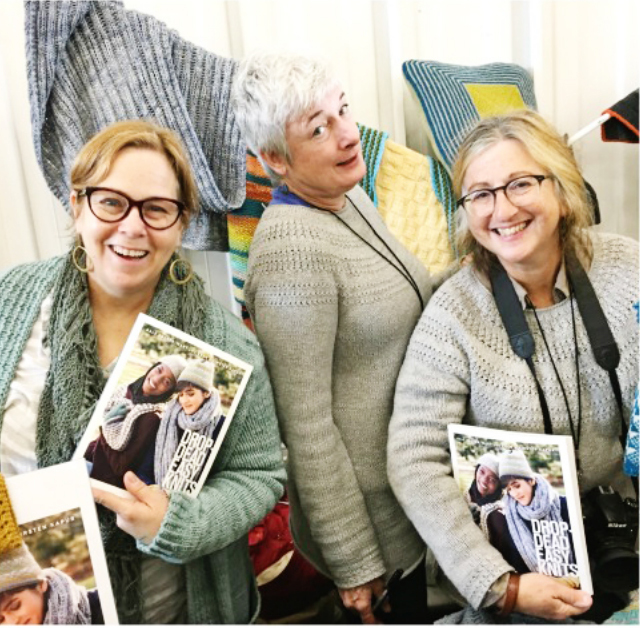 Don't let the lighting fool you, Mary Lou and I were wearing our matching silver grey Keynotes last October at NY Sheep and Wool Festival. We were well aware how dorky that is--but it did show off how this sweater suits a good range of body type. She is tall and slim with broad shoulders, while I am short and rounder and have average/narrower shoulders. You can easily substitute any DK weight yarn, like Tosh DK if you wanted a woolly version, or a very snuggly one of Malabrigo Dos Tierras (wool/alpaca) or Berroco Ultra Alpaca Light or if you want something wool-free, awesome feeling and machine washable, there's Berroco Remix Light. And, though I personally have not jumped on this bandwagon, this sweater would be a good candidate to turn into a fade, using skeins of handdyed, speckled yarns, if you've been toying with the concept but not sure which project to adapt. Meanwhile, you'll find me here there and everywhere in mine. Seriously--someone tell me to change my top! 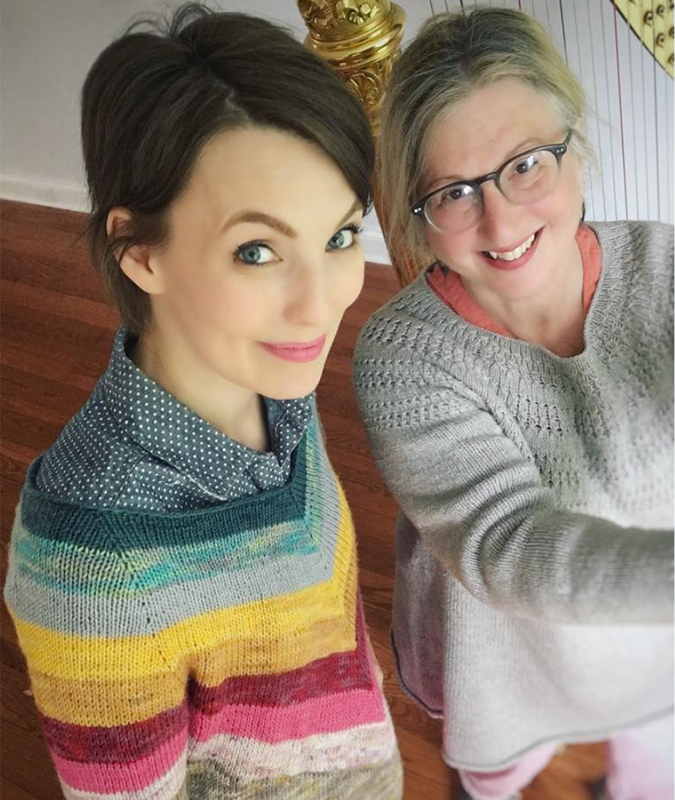 with Kristy Glass when I was on her podcast. Is she not adorable? You can really get a good view of my yoke if you follow the link to her YoutTube channel, while I bobble my head and blab. Also you can see, above, that mine fits a bit more tunic-style than the model's version. 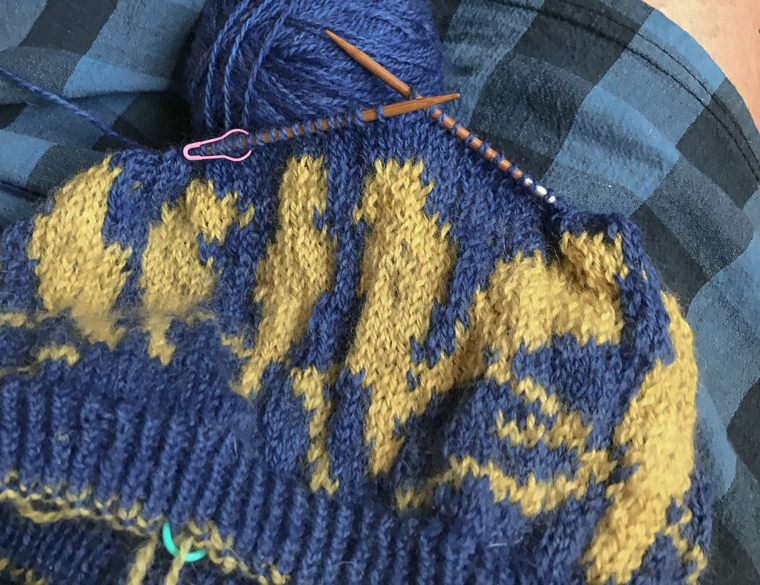 Since it is knit bottom up, you can determine the length to armpit pretty easily as you go. 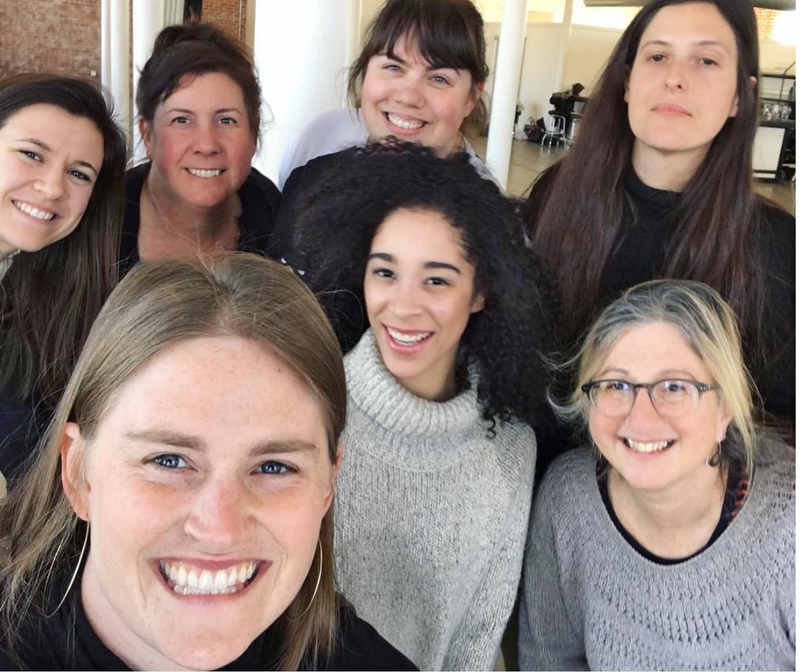 And here's a silly group selfie at the end of a photo shoot, and I am once again in my Keynote, bottom right.I wear it working, a lot. 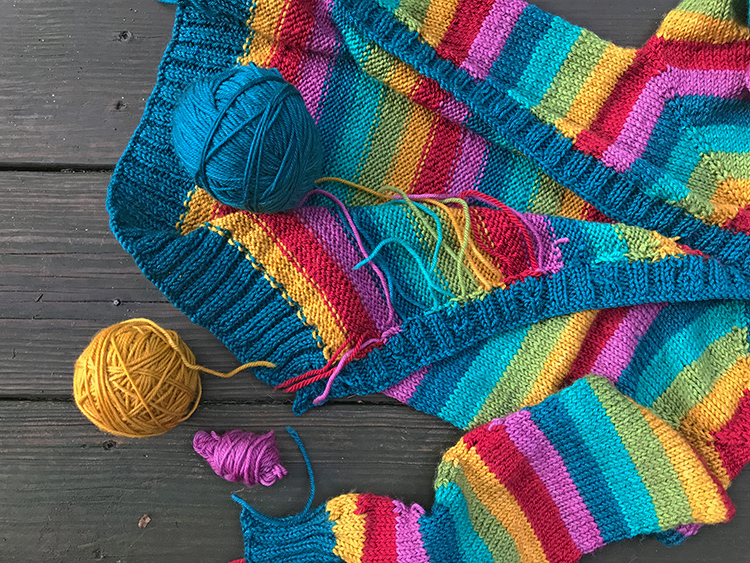 If you've got one knit or underway, share it on Ravelry with us!We love love love seeing what you make from the book and where you wear it. 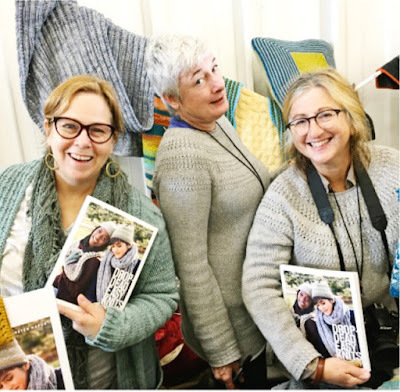 *if you check on Mary Lou's blog Yarnerinas or Kirsten Kapur's blog, Through the Loops, you will see that we're working our way through the book, sharing thoughts and ideas about the patterns. We jokingly said we'd do them in limerick, and I am , characteristically, the one who is taking that joke too far. 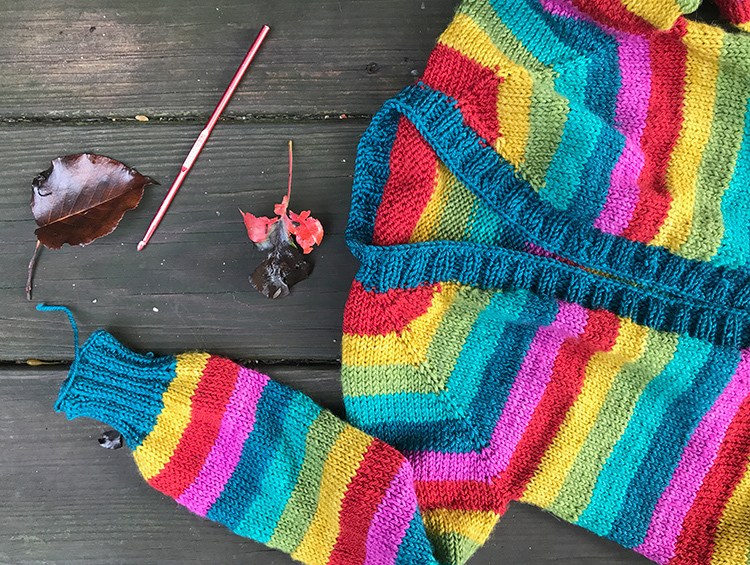 Finishing up this rainbow sweater is top on my to do list. As you can see, there're irrefutable signs of cool weather. I started it right around July 4th, so a Labor Day almost-finish is a nice symmetry. It's a special request from sweet Zoe, could I say no? She's so anxious to wear it that she reminds me to work on it every day. She tried it on as often as she could , while it was being knit, top down. It looks done to her, but I keep insisting " The ends! I need to weave in the ends !And buttons!" So that's #1 on the knitting /crafting/non-work to do list. 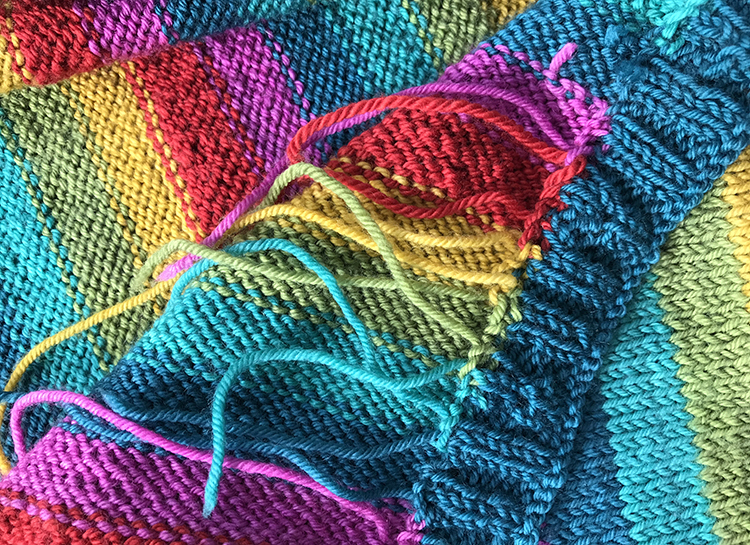 # 2 is more fun than end weaving--I only start new projects when I finish one already in progress, lest I tip into crazyland. I'm leaning towards a nice slouchy Farmhouse Cardi for me. Zoe thinks it should be a hat for me, to match her sweater, with the leftovers. #3 accept that the season is changing. This is a state of mind to-do item. We had the last full moon of summer neighborhood ladies skinny dip last night , the annual event that signals the end of summer to me. I'm working on it. * I'm going to try joining in the 3 things on thursday. I've always enjoyed reading the Think Write Thursdays but the concept of a writing topic assignment was just too much for me . However--3 things? 3 things! I can do that. More info over on Carole Knits.